The Ministry of Environment, Forests and Climate Change has submitted the affidavit with the findings of the first Survey of Elephants in Captivity to the Supreme Court. There are 2,454 elephants in captivity across the country of which 560 are in possession with forest departments and 1,687 with private individuals. 58 per cent of all captive elephants is concentrated in two states: 905 in Assam and 518 in Kerala. The National Green Tribunal (NGT) has asked for a performance guarantee of Rs 10 crore each from the governments of Delhi, Haryana and Uttar Pradesh expressing dissatisfaction over the cleaning of river Yamuna. A study to assess the environmental flow of the river Yamuna for the stretch between Hathanikund and Okhla and notes that it would not be possible to rejuvenate it unless minimum environmental flow was provided. Corruption Perceptions Index of Transparency International ranks countries and territories based on how corrupt a country’s public sector and judiciary are perceived to be by experts and business executives. The scores indicate the perceived level of public sector corruption on a scale of 0-100. A score of 0 points that a country is perceived as highly corrupt and a 100 points that a country has sound integrity systems. India’s score has been marginally improved to 41 from 40 in 2017 and ranking increased from 81st in 2017 to 78 in 2018. While Denmark is the world least corrupt country scoring 88 out of 100 points. Denmark is followed by New Zealand and Finland. Somalia has been ranked last with a score of 10 points. The Africa Centre for Climate and Sustainable Development was inaugurated by the Italian Prime Minister Giuseppe Conte at Rome. The centre has been opened by the Italian government in association with the United Nations Development Programme (UNDP) and the Food and Agricultural Organisation (FAO). The centre’s origin can be traced to a declaration endorsed by the G7 meeting of the Environment Ministers in 2017. The Beating Retreat Ceremony marks the conclusion of Republic Day celebrations. Through this ceremony, the defence forces which had come to the national capital to be a part of Republic Day celebrations are sent back to their barracks by the President. The Beating Retreat Ceremony is held every year on January 29th at Vijay Chowk. The Beating Retreat Ceremony was started in the early 1950s. The central banks of the United Arab Emirates (UAE) and Saudi Arabia have launched a common digital currency called ‘Aber’, which will be used in financial settlements between the two countries through Blockchains and Distributed Ledgers technologies. The key objective of the pilot project is studying the practical application of modern technologies and determining their impact on the reduction of remittance costs and assessment of technical risks and how to deal with them. K.J. 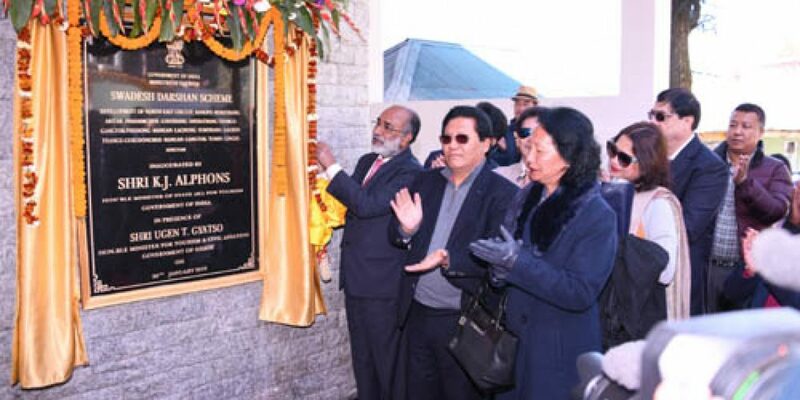 Alphons, Union Minister for Tourism, on January 30, 2019 inaugurated the first project under the Swadesh Darshan Project of the Union Ministry of Tourism at the Zero Point, Gangtok, Sikkim. The development of Tourism in North Eastern Region has been prime area of focus for the Ministry of Tourism. Swadesh Darshan Scheme, launched in 2014-15, is one of the flagship scheme of Ministry of tourism for development of thematic circuits in the country in a planned manner. Amnesty International on January 30, 2019 urged online travel sites to ban listings from Israeli settlements in the occupied West Bank. The group’s report titled “Destination: Occupation,” stated that rental sites such as Airbnb, Booking.com, Expedia and TripAdvisor are driving tourism to settlements that most of the world considers illegal. The Union Ministry of Statistics and Programme Implementation (MoSPI) on January 29, 2019 signed a Memorandum of Understanding (MoU) with the National Council of Applied Economic Research (NCAER) for improving official statistical system of India. Under the MoU, both the sides will use new data technologies, knowledge generation and knowledge sharing and capacity building in the field of Official Statistics. 1. How many elephants are there in captivity across India? 2. Which is the least corrupt country according to Corruption Perceptions Index 2018? 3. What was the rank achieved by India in Corruption Perceptions Index 2018? 4. Who opened the Africa Centre for Climate and Sustainable Development? 5. On which day Beating Retreat Ceremony is held every year in India? 7. Where is the first project under the Swadesh Darshan Project of the Union Ministry of Tourism?